Invented by Zied Haddad, Musketeer Chess is played like Chess except that the two players agree upon a couple of extra pieces to use in the game, which are kept offboard behind two pieces in the back rank until the pieces in front of them move away. This game includes ten extra pieces players may choose from. Any game of Musketeer Chess uses only two out of ten of these pieces. 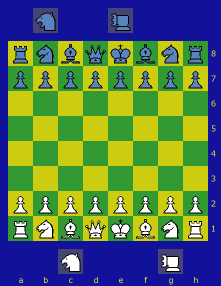 Click here or on the diagram to play Musketeer Chess against other people on Game Courier. This preset for Musketeer Chess has been programmed to enable piece selection, to enforce the rules, to display legal moves, and to recognize win/loss/draw conditions. Musketeer Chess. A game that adds extra pieces to Chess, playable online with Game Courier. Author: Fergus Duniho. Inventor: Zied Haddad.